Welcome to our review of the Bushnell G-Force DX ARC 6x21mm Laser Rangefinder. Bushnell has a number of excellent optics products, and I was excited to try out this rangefinder. It’s one of the most feature-rich rangefinders I’ve seen in its class, but how well does it perform? Let’s find out. How Far Can the Bushnell G-Force DX ARC 6x21mm Laser Rangefinder Reach? Let’s start with how far the rangefinder can detect and return a reading. Bushnell advertises the Bushnell G-Force DX ARC 6x21mm Laser Rangefinder as being usable from 5 to 1,300 yards, but you need to bear in mind that number is referring to a highly reflective target. In real life use away from the shooting range, the Bushnell G-Force DX ARC 6x21mm Laser Rangefinder can accurately range a tree as far away as 900 yards and can give you a reading on a deer from 600 yards. Accuracy of the Bushnell G-Force DX ARC 6x21mm Laser Rangefinder is phenomenal, at +/- half a yard to 199 yards and +/- 1 yard accuracy from 200 to 1,300 yards. Is the Bushnell G-Force DX ARC 6x21mm Laser Rangefinder Easy to Use? This rangefinder is incredibly easy to use. It features single-button operation for all modes, and it offers up a form factor that fits nicely in your hands with just enough stippling to help you keep a firm grip on your investment. The menus are intuitive and simple to use, and the rangefinder has automatic focus capability along with a diopter adjustment. The only drawback to the ease of use is the readout display. You get a red display, with no choice to change to a black readout for bright lighting conditions. Even at the highest brightness settings, the readout is difficult to read when the sun is high in the sky and unobscured by clouds. 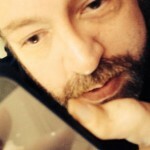 Shading either the objective lens or the eyepiece with your hand helps alleviate this problem. What Powers the Bushnell G-Force DX ARC 6x21mm Laser Rangefinder? The Bushnell G-Force DX ARC 6x21mm Laser Rangefinder is powered by a single CR2 battery, and one is included in the box. I’ve said it before, and I’ll say it again: rangefinders need to quit using CR2 batteries. These batteries are difficult to find when you are out in the field, so you need to be sure to pack along a spare in case your battery goes dead. With that said, the Bushnell G-Force DX ARC 6x21mm Laser Rangefinder gets excellent battery life, lasting for thousands of readings from a single battery. What Features Can I Expect From the Bushnell G-Force DX ARC 6x21mm Laser Rangefinder? This rangefinder is feature-packed, starting with 6X magnification and Vivid Display Technology (VDT) for better contrast, clarity, and light transmission. The Bushnell G-Force DX ARC 6x21mm Laser Rangefinder also utilizes the second generation of Bushnell’s Extreme Speed Precision (E.S.P. ), which provides lightning fast readings with 1/2 yard accuracy out to 199 yards. The Bushnell G-Force DX ARC 6x21mm Laser Rangefinder has Bushnell’s Variable Sight-In Feature, allowing you to set your holdover and bullet drop information specifically for your rifle. In Rifle mode, the rangefinder provides holdover and bullet drop information out to 800 yards, and Bow mode gives you true horizontal distance for your shots out to 99 yards. For targeting modes, you get Brush mode to ignore items like brush, boulders, and tree branches in the foreground. On the other hand, Bull’s Eye Mode gets you the distance to small objects near you, ignoring the objects in the background so you don’t accidentally range a tree on the other side of a clearing. As another nice feature Bushnell G-Force DX ARC 6x21mm Laser Rangefinder has built-in Angle Range Compensation to give you the distance to your target taking into account upslopes or downslopes. The eyepiece of the Bushnell G-Force DX ARC 6x21mm Laser Rangefinder allows you to adjust the diopter for use with or without glasses, and the unit is compatible with Bushnell’s magnetic attachment system. Personally, I’m not a fan of the MAS, because I’ve seen it fail a time or two, but this particular model is protected by Bushnell’s Bulletproof 100% Money Back Guarantee. So, if the MAS does fail on you and your rangefinder is damaged, at least you have some reassurance that you can get your unit replaced free of charge. The rangefinder also provides a tripod mount for setting the rangefinder up on a camera tripod. Thanks to the fully multi-coated optics and the VDT, the Bushnell G-Force DX ARC 6x21mm Laser Rangefinder has amazing light gathering capabilities. I’ve used this rangefinder in the early morning hours on overcast days, and it never failed to provide me with a crisp, clear image and a perfect range readout. Some reviewers have complained of a hazy box surrounding the target, but my experience has shown that turning the brightness setting down to its lowest option resolves that issue. Optics and focus are quite good, allowing you to get a crisp and clear image of your prey before you take your shot. The unit auto-focuses, and it does so quickly and intuitively. I’ve never had it fail to focus in on a target, whether I was ranging a squirrel from 200 yards or a deer from 600 yards. How Durable is the Bushnell G-Force DX ARC 6x21mm Laser Rangefinder? The rangefinder is constructed with a metal case and rubber armor, and is quite rugged. The outer surfaces of the objective and eyepiece lenses are coated with RainGuard HD, a water repellent lens coating that prevents fogging by causing the condensation from rain, sleet, snow, or your own breath to bead up into smaller droplets than on standard coatings. 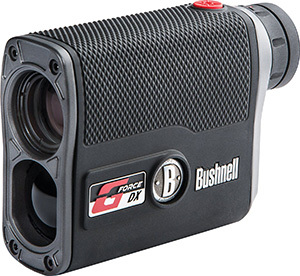 Thanks for reading this review of the Bushnell G-Force DX ARC 6x21mm Laser Rangefinder. This rangefinder is a real value, with very few flaws. You might experience difficulty reading the display in bright sunlight, and the device requires hard-to-find batteries, but both issues have easy workarounds to help make the device easier to use. I have the arc dx 1300 it is my first rangefinder i don’t know how i survived aad actually bagged game the last 40 years of hunting without it. I love the options it has, it ranges in either yards or meters it has holdover in either inches, centimeters, miles or MOA and has a ballistic calculator for thousands of calibers so with my Vortex diamond back with bdc each graduation is 2 mils, which is perfect i set up my riffle with the corresponding groups of Bushnells balistics table and programmed it into the range finder. Well it worked super fast and easy we teates it out to 550 meters and the rangefinder holdover which told me 21/2 mils i was hitting steel every shot. The price has also come down alot so if you look on ebay they had semi open box units for $190 with warranty. I love it and it has built my confidence level tremendously.